Today is my runniversary. On July 11, 2013, I walked down to the Gorzycki middle school track and I ran a mile. This journey didn’t start with that run. It’d actually started on, I think, July 8th after I looked at some photos of myself in a bathing suit from a recent vacation in Cabo, and after looking at myself in the mirror after getting out of the shower. I didn’t like who I’d become. I was overweight and I didn’t have the stamina I wanted and needed to keep up with our daughter. So I decided to download an app for my phone and track my speed and distance on some bike rides I was going to start taking. 12 years prior I used to ride my bike eight miles to work, and then eight miles home. I started watching my diet, and not long after, pounds started shedding. On the morning of July 9, 2013, I hopped on a bike and went on a half mile ride. I only made it a half mile because my hip immediately started hurting. You’d think a low impact activity like riding a bike wouldn’t cause hip pain, but it did. I came home and decided I’d try again the next day. The next day, I rode eight miles, but my hip was still hurting to the point where I knew I couldn’t try another day. So on July 11th, I decided to go to the track and see how fast I could run 1 mile. Just a mile. It wasn’t until I was 4 miles in to a 6 mile run this morning that I remembered today was my runniversary. 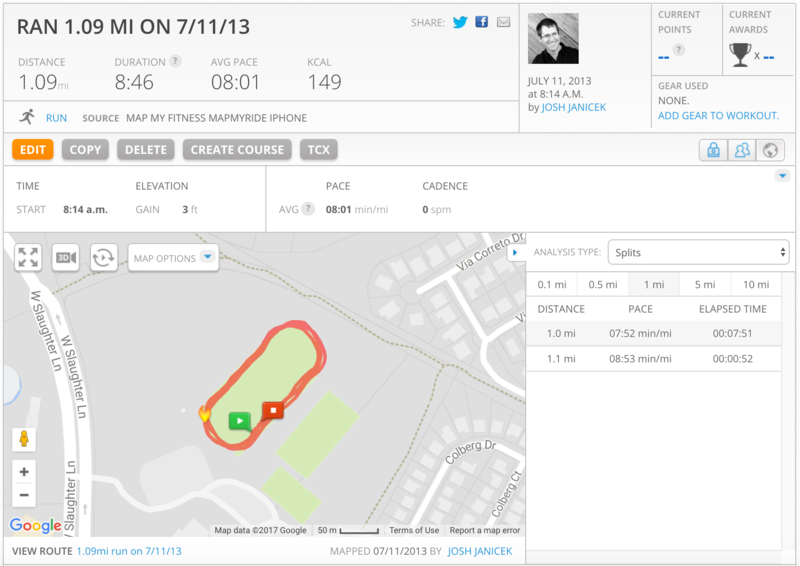 My plan was to return to that same track and see how close I could come to pulling off a 5-minute mile. But, alas, I wasn’t prepared. Better yet, I just didn’t remember. Maybe I’ll go hit the track this evening. Maybe not. And here’s to 985 runs covering 6,247.01 miles so far. Lots more ground to cover!